Beneath the Mendip Hills a wide variety of caves can be found, with systems to suit all ages and abilities. From Active stream caves such as Swildon’s Hole and Longwood Swallet, to some of the most extensively decorated caves in Britain including Reservoir Hole, the caves of Fairy Cave Quarry and Charterhouse Cave, to the caves of Burrington Combe - ideally suited to the novice caver. 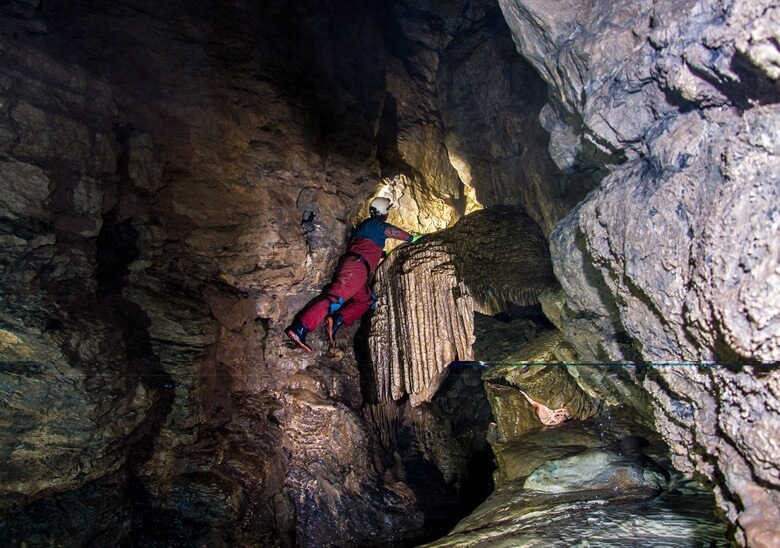 With many other varied and interesting and/or challenging sites to explore, Mendip has a lot to offer whether a novice or seasoned, horizontal or vertical caver. Adding to the extensive network are our intrepid cave diggers; with new caves and passages being found every year. Some of the caves on Mendip are open access, requiring just suitable insurance. But for most of those that are not, the MNRC have Leaders/Wardens and can issue permits and keys as required. The MNRC is a member of the Council of Southern Caving Clubs, the Charterhouse Caving Company Ltd (CCC) and the British Cave Research Association. This allows the club full access to caves in the restricted Charterhouse Area and the others on Mendip. As with other CCC Ltd clubs, the MNRC has leaders for Charterhouse cave. We can issue permits for CCC controlled caves at 50p for a 14 day temporary permit, and can also issue keys for access to most of the gated caves on Mendip, for a £1 administration fee plus £10 returnable deposit. The MNRC organize various Mendip caving weekends throughout the year to suit the demands of an active caving club. We hold novice weekends, training sessions, rescue practice and digging as well as general caving weekends. As well as joining in with other digging groups, we have done a considerable amount of digging at Hillgrove Swallet - one of the country's oldest cave dig sites. The MNRC, in addition to local caving trips and activities, also organize club trips to other caving regions, both in the UK and abroad. Inc Yorkshire, Derbyshire, S.Wales, France & Spain. Details of larger upcoming trips are listed on the events page, smaller trips in Mendip happen most weeks and are not listed. To join us on a trip please visit the contact page for details on how to get in touch!